Hello everyone. 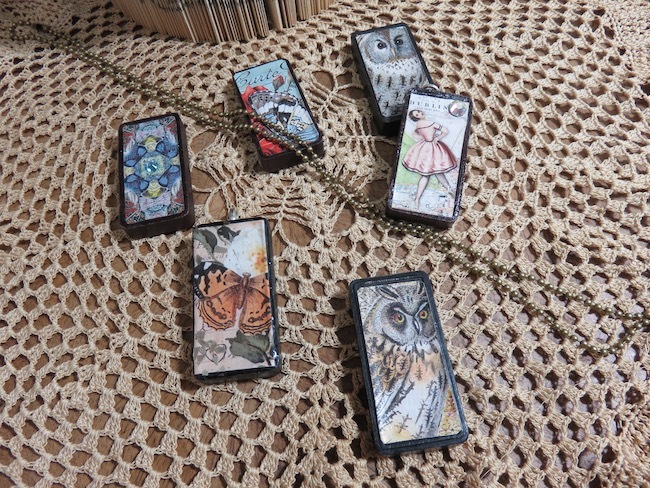 I am back this month with a show and tell of my vintage domino charms. 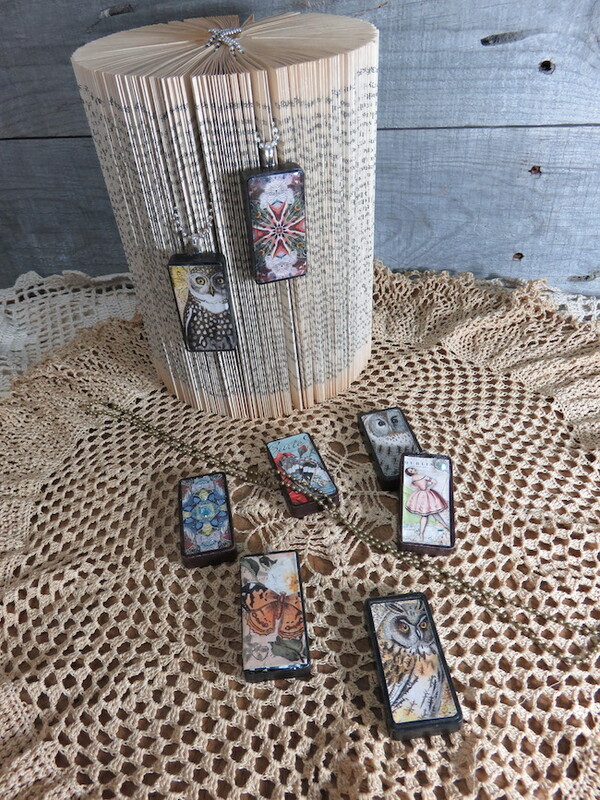 I love to find ways to repurpose vintage items and have for many years been collecting vintage dominoes and creating domino charms with them. On The Graphics Fairy Premium Membership site there are several gorgeous domino collage sheets to choose from. The images are already sized to a standard domino. If like me you have collected smaller or larger dominoes, and you can easily resize the image when printing. 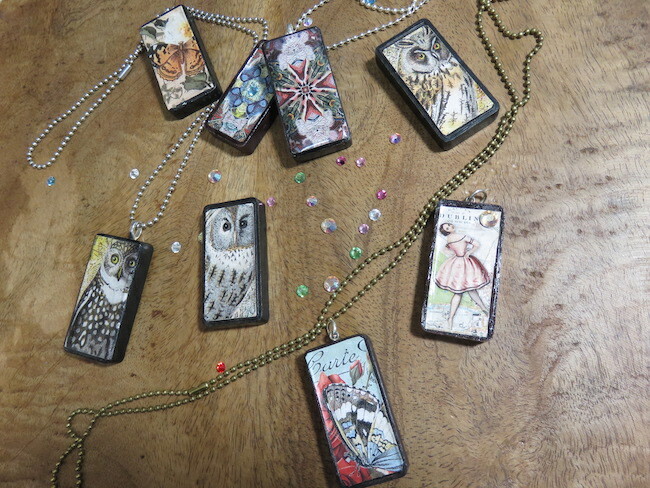 While I usually work with resin for a durable finish when creating domino jewelry pieces, I also have used various decoupage and paper sealer mediums. Some of these may be easier for you to work with, especially if you are doing this fun project with children. 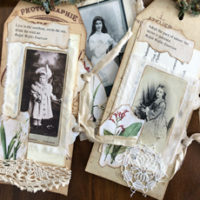 You can adhere and seal your images with: Mod Podge, Collage Pauge, Glossy Accents, Diamond Glaze, or any artist medium for sealing paper/art that you prefer. For a more durable finish without using resin I have used Glossy Accents and Diamond Glaze. For a vintage look I like to use a matte medium paper sealer. 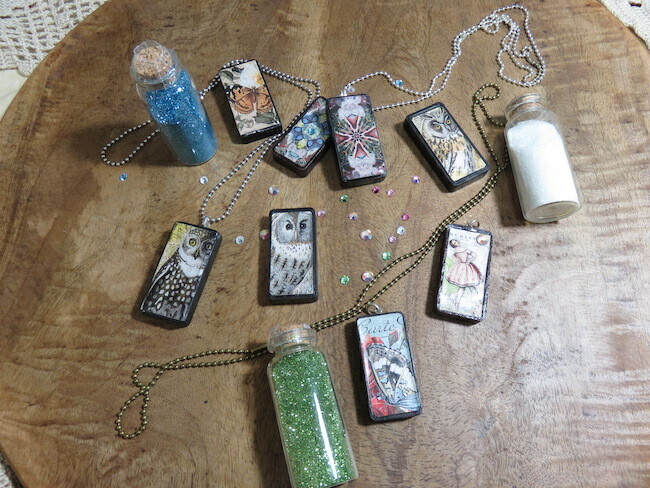 If you are in any way hesitant to try resin without instruction you can review my resin domino charm tutorial, which is available on The Graphics Fairy Premium Membership Site. 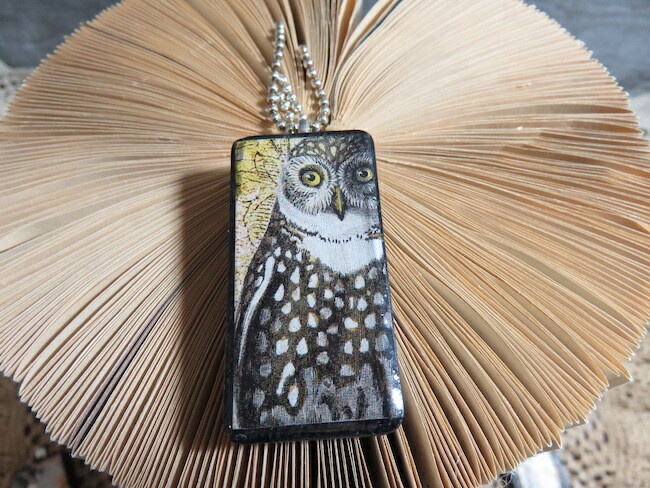 When working with resin and some of the other decoupage paper sealers you can add additional embellishments to your images: glitter, micro beads, rhinestones and even small charms. If you cannot find or do not like the look of the vintage wooden dominoes, this easy craft project can also be created using newer plastic or wooden dominoes as your canvas. Experiment. In an effort to reuse leftover supplies I have been saving wood scraps to create my own faux dominoes too. While creating with the dominoes and seeing the variety of domino images available from the Premium site, I decided to try my hand at mini journals using my dominoes as book covers, and I fell in love! What a fun and versatile project to really let your creativity flow in a miniature journal format; you can read about them in my last post HERE on the Blog. A domino journal tutorial is coming soon to the membership site. 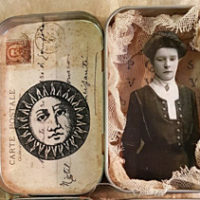 Kelly from Book and Paper Arts, another of the talented artists on this Mixed Media & Collage Design Team, creates amazing altered Altoid tin shrines and shadow boxes that you can view on The Graphics Fairy Blog. We also chatted briefly about using dominoes in those tins, which I thought was a fabulous idea. Think of the lowly domino as a tiny but mighty blank canvas to create art on! Thank you for taking the time to read about my April Design Team Project. Take care and happy creating. « 7 Vintage Group Photos of People! 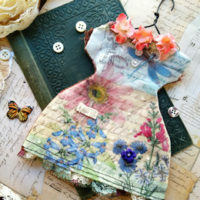 I love this site and the way you bring everything vintage to life. The one thing I don’t like is I’m unable to afford a subscription. Being in a fixed income I can’t get everything that is needed, but thank you for the free stuff that’s offered. You’re amazing. Where can I find vintage looking card stock?